83. The Jewish Agency for Israel (JAFI, Sochnut) is a Jerusalem-based organization that works to build Jewish identity and enhance ties between diaspora Jews and Israel. JAFI offers a number of programs designed to encourage aliyah (immigration to Israel) of local Jews and their family members. The writer met with Ilana Shpak, who directs JAFI operations in Ukraine, and Ellina Zadavitsky, who is in charge of JAFI education projects in the Kyiv region, which includes Kyiv itself, western and central Ukraine, and Moldova. Both women were born in the Soviet Union and emigrated to Israel some years ago. Ms. Zadavitsky stated that JAFI follows four strategies in building Jewish identity and encouraging aliyah: Jewish camping, Israel experiences, grassroots activity and leadership development, and aliyah encouragement and absorption in Israel. Informal Jewish education is a key component in all of these programs and formal education is pursued in the teaching of Hebrew. JAFI-sponsored Jewish residential camps enrolled 220 youngsters in the region in 2013, said Ms. Zadavitsky. Recognizing that intensive Jewish experiences are critical in building Jewish identity, summer camps are a keystone of JAFI programming. However, the Jewish Agency is aware that residential camps have little appeal to some families and has searched for alternative programs that would provide Jewish youngsters with an alternative intensive Jewish experience. Accordingly, the Agency unveiled a pilot day camp program in 2014, accommodating 135 youngsters in four-day camps during school spring vacation periods in Kyiv and Cherkasy; co-sponsors in the two cities were the Progressive movement and Chabad respectively. Before the end of 2014, additional day camps will be held in Kyiv and Vinnytsia, again with partner organizations. All participating children attend either public schools in their respective cities or the ORT school in Kyiv. For the youngsters from public schools, Ms. Zadavitsky observed, the day camp provided their first exposure to Jewish culture. Another form of partnership is matza-baking in the JAFI courtyard. 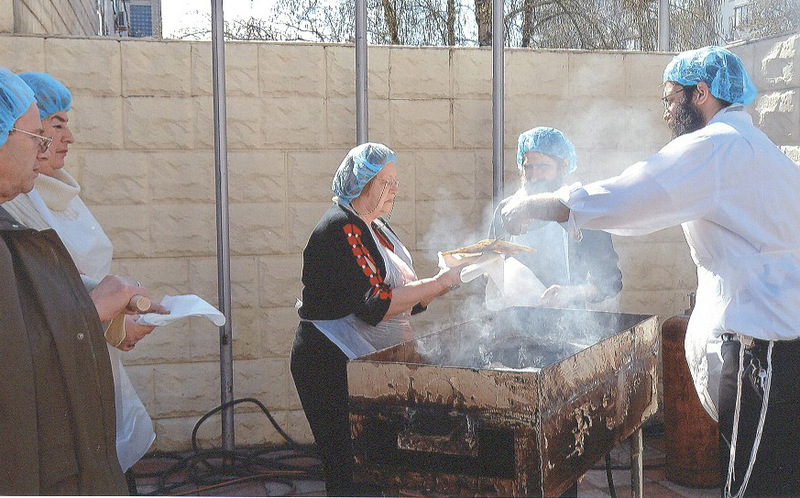 In this photo, representatives of Chabad bake matza and distribute it to JDC hesed clients who have been brought to JAFI for the occasion. Grassroots and leadership development programs focus on young adults who are veterans of other JAFI programs, such as summer camps, Taglit, and MASA. Campers are trained to be madrichim (camp counselors, youth leaders) and 35 Taglit veterans meet twice monthly for continuing informal education and additional Jewish activities. Some young adults have pursued JAFI-supported incubator projects and others are engaged in the PresenTense program described earlier (pages 99-100). Attempting to fill a gap for teenagers, the Jewish Agency initiated a new program in 2014 called Kyiv Interaction. Kyiv Interaction enrolls 30 Jewish teens between the ages of 13 and 17 in a program that features visits to Jewish heritage sites and, so far, participant creation of an interactive website about Kyiv Jewish history. 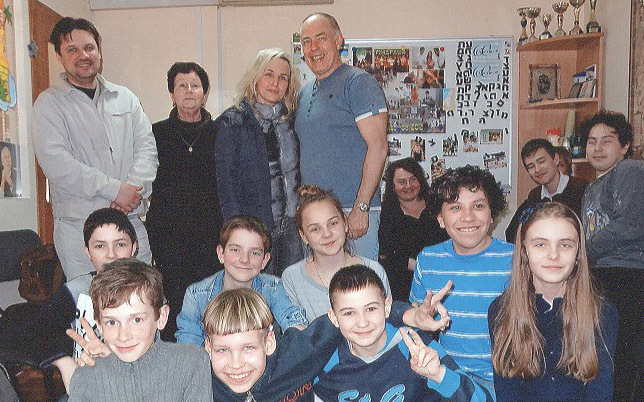 In Cherkasy and Vinnytsia, JAFI sponsors local Jewish youth clubs that enroll 115-120 young people in total. In both cities, said Ms. Zadavitsky, JAFI employs very gifted local madrichim who have been trained in JAFI summer camps and leadership development programs. The Jewish Agency currently operates 31 Hebrew-language ulpans in the region and anticipates opening additional classes as interest in emigration to Israel grows. Participants must pay a monthly fee of $25; courses last five months and include Jewish identity-building components. Ten of these ulpans are self-financing, i.e., participant fees cover all costs. JAFI also operates eight Sunday schools - in Kyiv (in partnership with the Progressive movement), Bila Tserkva (Belaya Tserkov), Cherkasy, Chernihiv, Khmel'nytski, and several additional locales. Most of these schools are day-long programs for children up to 13 years of age; some include parallel curricula for parents. 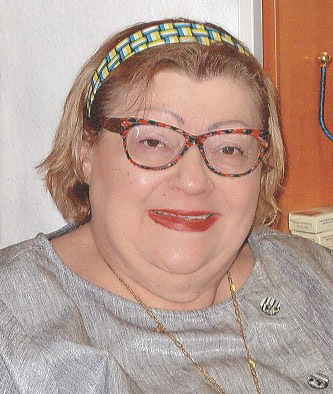 Aliyah brought 405 Ukrainians to Israel in 2013, said Ms. Shpak, and 153 more will have gone by the end of April 2014. She is sure that aliyah will continue to grow because many more people are seeking information about the aliyah process and resettlement in Israel. Also, she noted, the number of applicants for the Na'aleh high school in Israel program and the Selah college preparatory course has risen substantially. In addition to the students themselves, parents frequently join their children in Israel at a later time. The writer met with a group of about 20 youngsters in the Bar/Bat Mitzvah program and their parents. At the time (early April), the B/BM candidates said that they were learning about the forthcoming holiday of Pesach; they had made matza with Chabad and soon would hold a mock seder. In May, they and their parents would participate in a B/BM Shabbaton outside Kyiv and also would participate in Israel Independence Day programs. Parents of the kids said: the youngsters like the program, the madrichim treat the children with respect, both the youngsters and their parents learn about Jewish tradition and Jewish history, and both the youngsters and their parents make new friends in the program and expand their social circles. All of the children were enrolled in public schools, although one had attended a Jewish day school for a few years and dropped out because the day school day was too long. The kids like the B/BM program because they have friends there and they are able to use the JAFI computer lab. Six of the eight youngsters said that they would like to join the Na'aleh high school program in Israel when they reach the age of 15. Many participating families have relatives in Israel. A somewhat boisterous group of Bar/Bat Mitzvah candidates and their parents and other relatives met with the writer in a very crowded room in the JAFI building. More than half of the youngsters appear to speak excellent English. The writer also met with two madrichim of youth groups. One works part-time for the Jewish Agency in Vinnytsia. A graduate student of Kyiv Jewish history and a teaching assistant in a Vinnytsia university, he leads Jewish adolescents on Jewish history tours and assigns real research projects in local history to Jewish teens. Members of his youth group also volunteer in the maintenance of old Jewish community buildings and have created a brochure and interactive website about Kyiv Jewish history. The second madrich trains Jewish young people to be tour guides of Jewish history in Kyiv, Vinnytsia, and Cherkassy. Twelve recent veterans of Taglit (birthright Israel) and/or MASA spoke with the writer in another conference. (Most appeared to be students or recent graduates.) Only one had attended a Jewish day school (in Lviv, her hometown). Of the Taglit veterans who had not yet participated in MASA, some are considering the various MASA options; several programs look attractive to them and it is likely that they will go. Most said that they were thinking more seriously about aliyah since their Israel experiences. Maidan and the subsequent uncertainty were not major factors in their decision-making; nearly all of them said that they had been thinking about aliyah for a long time. Asked about their parents' views of aliyah, some said that their parents think that life in Israel is too dangerous. Others responded that they don't expect their parents to join them in Israel because they are too old or because one parent is not Jewish. About one-half of the young people said that they have relatives in Israel; some said that the presence of family members is an important inducement, others stated that they are not close to their Israeli family members and are unlikely to spend much time with them. The writer also spoke with four family units that would make aliyah to Israel in the very near future. A couple with a toddler son was scheduled to leave Kyiv in less than two weeks; they would join relatives in Lod. A couple with eight-year old daughter would go to Israel in a program featuring direct absorption in a large city; the parents, both of whom are accountants, lost their jobs when their employer went out of business. They are going to Israel for the future of their daughter, they said, and one set of grand-parents will join them later. A couple with two children, ages 3 and 5, were leaving the next week. They have been thinking about aliyah for five years, they stated, and have enrolled in the First Home in the Homeland absorption program. (This absorption program is on a kibbutz and is considered ideal for families with young children.) A single mother is going on aliyah with her eight-year old daughter; a manicurist by trade, she and her child also will join the First Home in the Homeland program. Concluding the writer's visit to the Jewish Agency, Elena Shpak made several com-ments. The Maidan protests and associated violence impaired JAFI work for some time, she said. JAFI cancelled some Chanukah and Purim events due to violence on the streets. The office itself was closed for three days because conditions seemed too dangerous for employees to come to work. Families are very concerned about potential violence and are leery about sending their children far away from home and/or near Ukrainian borders. Thus, she continued, although the Jewish Agency had planned to hold its summer camps at a site near the Carpathian Mountains (close to borders with Poland, Slovakia, Hungary, Romania, and Moldova), they have had to find a site closer to Kyiv. Elena Shpak previously directed JAFI operations in eastern Ukraine, but was transferred to Kyiv when the earlier Kyiv emissary proved unsuited for the position. Although aliyah has increased in response to the situation, it remains an aliyah of choice, not an aliyah of rescue. Jews are weighing their options, taking various factors into consideration before making a decision to go to Israel. Once they decide to go, they examine the various absorption programs very carefully. Some middle-age Jews who believe that they have job security in Ukraine send their teen-age or young adult children to Israel and join them later. Many Jews believe they are fortunate to have Israel as an option. Non-Jews have far fewer alternatives - and some have even asked JAFI if emigration to Israel is a possibility for them. Obviously, the Jewish Agency welcomes aliyah to Israel. However, sometimes aliyah takes a toll on its own staff. The five leading madrichim in Kharkiv, who staffed all JAFI youth programs in the city, all made aliyah last year, leaving JAFI in Kharkiv with no experienced youth leaders. 84. The American Jewish Joint Distribution Committee was functioning without a director for its Kyiv and central/western Ukraine operations during the writer's April visit to the Ukrainian capital. The previous director departed, at his own request, and returned to Israel in late 2013, and a new director had not yet been appointed. Notwithstanding the absence of a director, the writer visited the new JDC head office, located in a Podil office building. (The space had been leased by the outgoing director prior to his departure.) Access to the office is gained through a small vestibule several steps up from street level and then a climb up a steep stairway of some 20-25 steps. No elevator exists. The office itself is light and airy, with a partially open corridor stretching through a long rectangular space of multiple work areas. The premises are multi-level, up three stairs in one place, then down three stairs in another, perhaps followed by a level expanse of four to six meters before an elevation of two steps followed by a descent of two steps three meters later. It is difficult to imagine how any individual with mobility issues could enter this office, much less work in it. See pages 57-59 for additional information about Ms. Shpak. JAFI is not the only provider of Taglit tours in Ukraine. The Hillel student organization often enrolls more participants than JAFI. Several other groups also offer Taglit programs to Ukrainian Jewish young people; however, these programs usually are considerably smaller. Financial support for Tsror and the Bar/Bat Mitzvah program is provided by the Jewish United Fund/Jewish Federation of Metropolitan Chicago and a private donor. Bar/Bat Mitzvah preparation occurs under the guidance of Rabbi Aleksandr Dukhovny (Progressive) and Rabbi Reuven Stamov (Masorti). Formal and informal computer instruction is a scheduled component of the Bar/Bat Mitzvah program. Some fear that an ongoing territorial issue between Moldova and the pro-Russian breakaway de facto state of Transnistria might lead to a Russian incursion into Moldova and southwestern Ukraine.